An Almost-Final Word On The IRS's Alleged Tea Party Targeting : It's All Politics A two-year bipartisan Senate investigation found the agency needs to cut through bureaucratic red tape and institute better communication and management. 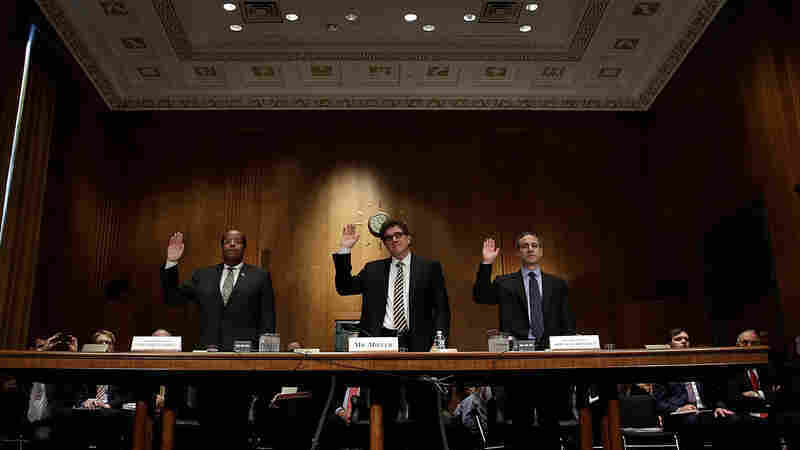 J. Russell George, Treasury inspector general for tax administration (from left), Acting IRS Commissioner Steven Miller and former IRS Commissioner Douglas Shulman before they testified to the Senate Finance Committee in 2013. In what may be a perhaps-almost-final word on the 2013 IRS controversy and alleged targeting of Tea Party groups, a two-year bipartisan Senate investigation found the agency needs to cut through bureaucratic red tape and institute better communication and management. But members of the Senate Finance Committee, which issued the report, were largely split along party lines on the question of why the IRS went off the rails. Republicans charged that they were stymied in finding out "the full extent of Treasury Department and White House involvement." Democrats called it "not a matter of political targeting, rather one of gross mismanagement." The Senate committee, unlike several House probes memorable for their vitriol and snark, kept a low profile. It produced a report with many bipartisan findings, plus a 90-page timeline of the IRS actions. Upper management should be kept in the loop. The report says Lerner failed to alert her superiors as her section began grappling with the influx of applications. This all goes back to the scrutiny the IRS gave to politically active "social welfare" organizations between 2010 and 2013. Conservatives allege that mainly Tea Party groups were targeted. The controversy led to a housecleaning at the top of the IRS — also, to a collapse in the agency's already feeble attempts to enforce its existing rules on political activity by 501(c)(4) social welfare groups. The numbers and budgets of politically active social welfare groups have soared since the Supreme Court's Citizens United ruling in 2010, especially among conservatives. SuperPACs, which are also used by both sides, must disclose their donors, while 501(c)(4) groups have no disclosure requirement.